Pacifica's incredible 10-well coconut infused eye shadow palette uses multicolored, flipping mineral crystals in each super wearable color. Velvety finish with a gorgeous payoff. For otherworldly fearless beings, a collection of crystals for your beautiful eyes. 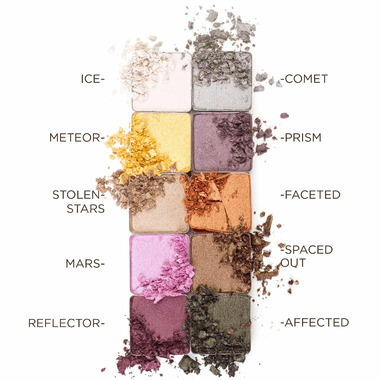 Highly pigmented mineral eye shadows in a range of your new, super wearable favorite colors. Ingredients: Mica, Gluconolactone, Caprylic / Capric Triglyceride, Silica, Zinc Stearate, Boron Nitride, Benzoate, Calcium Gluconate, Cocos Nucifera (Coconut) Extract. May Contain: Mica (CI 77019), Titanium Dioxide (CI 77891), Iron Oxides (CI 77491, CI 77492, CI 77499), Tin Oxide (CI 77861). 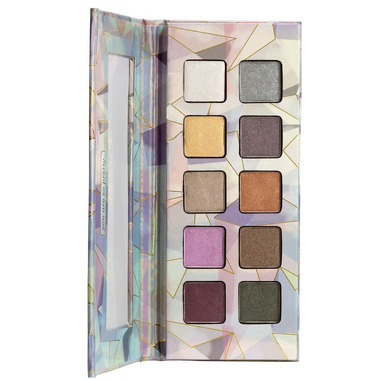 Despite this product being American, and thus automatically more expensive on account of the low Canadian dollar, this eye shadow set is a bargain. The colours are soft and easy to blend, and one application lasts me all day. I like this shadow palette much better after experimenting with it then I did when I first got it. The colours are really nice, and apply smoothly with minimal fallout. The white looking one on the top left has a pinky, opalescent shimmer. The shadows are not as pigmented as I thought they would be, and applying with a wet brush doesn't help much either. However, they blend well, and stay put all day. I'm actually quite impressed by how nice my eyeshadow still looks after a 10 hour day. I've found that there's no need to carry the palette with me for touch ups during the day, but it's small enough to fit in my makeup bag if I want to carry it with me.